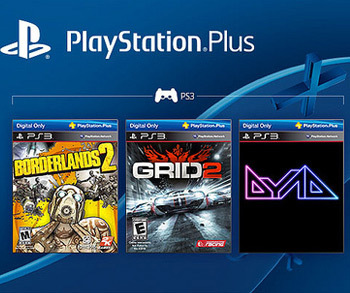 PlayStation Plus members will be spending their holidays with Borderlands 2, Grid 2, and Dyad. December is nearly here, which means that gamers need to start seriously thinking about how they'll spend the holidays. After all, without a solid plan, you might do something silly like start a pair of never-ending, open-world RPGs, and then your entire vacation is shot. Luckily, Sony has unveiled December's PlayStation Plus titles, so you should be able to plan ahead. Next month's PlayStation 3 offerings haven't been on the market for very long, so they still have that new car smell. Grid 2 hit retail shelves last May and quickly became a favorite among critics and fans. This racing title by Codemasters Southam allows players to drive recklessly through real-world locations like Paris and Barcelona. Borderlands 2, on the other hand, is far less concerned with real-world authenticity. When Gearbox Software released Borderlands 2 in 2012, it immediately found critical and commercial success, and snatched up several Game of the Year awards. It also went on to spawn nine expansion packs. If those games aren't enough for you, PlayStation Plus members will also have access to Dyad, a 2012 title that combines shooting, music, racing and puzzles (which sounds impossible until you actually play it). Vita owners will enjoy Sonic & All-Stars Racing and Urban Trial Freestyle. The PlayStation 4's PS+ lineup wasn't mentioned in today's announcement, but Sony will probably tackle it very soon. Until then, you have plenty of other distractions.